Humans have never been great at the whole ghost thing. They all look like white bed sheets with black circles for eyes. Blind Cusk Eels, on the other hand, now they're almost 100% pure ectoplasm! 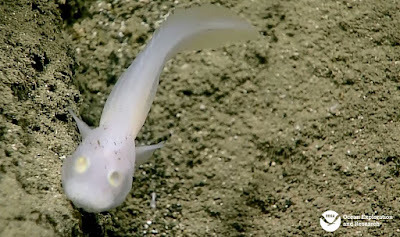 It takes but a glimpse to know that the Blind Cusk Eel belongs to the deep sea. From the pale, scaleless skin to the gelatinous flesh and reduced, unpigmented eyes, it speaks of a place of pitch darkness, where normality itself is crushed by the unrelenting pressure. Only the bizarre may survive. 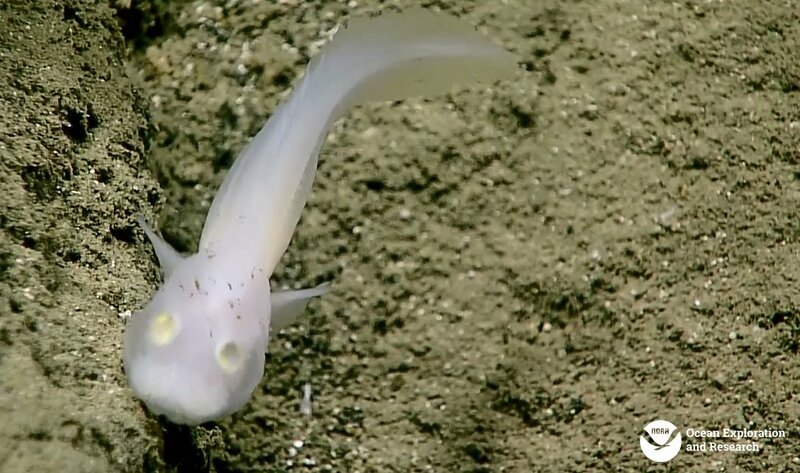 Blind Cusk Eels come from tropical and subtropical waters across the world, at depths below 700 m (2,300 ft). 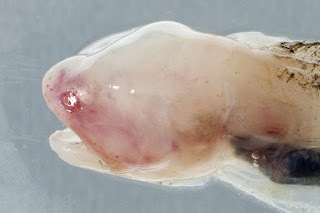 They belong to the same order as the Cusk Eels, but the Blind variety belong to a family of their own, Aphyonidae. There are two dozen species, and they all look quite a lot like a Cusk Eel that died and came back as a ghost to haunt its old, er, haunts. The weird thing about Blind Cusk Eels is that they're not quite done yet. They're neotenous, which means that, like the famous Axolotl, they bear certain larval characteristics right into adulthood. So things like their skeleton, muscles and gills are sort of unfinished, undercalcified or underdeveloped. Even their eyes, nasal organs and lateral line are reduced. That's a whole lot of sense organs! It makes one wonder how exactly they manage to find their food. Perhaps, when it comes to survival, they have but a ghost of a chance. Perhaps that's enough. Speaking of larval characteristics, it's always nice to see a bit weirdness in the reproduction department. Here's some. Male Blind Cusk Eels produce little packets of sperm called spermatophores, which he hands over to the female. This is normal for salamanders, arachnids and cephalopods, but not fish. The sperm will keep for quite a while so the female can fertilise her eggs when she's ready. In fact, it will keep for so long she doesn't need to be an adult before she grabs a few bags of sperm to lug around. It's like an engagement ring. Sort of. Some kind of promise of intent, anyway. Not only does this help with solving the problem of reproduction in the big, pitch black sea, where you need to grab hold of any opportunity you stumble on and never let go, but it's also somewhat romantic. In a creepy kind of way, admittedly, but that's the only kind there is in the deep sea. What would happen next for most fish, even deep sea ones, is that she would lay lots of eggs that float up to the surface. Tiny larvae would then drift around and gradually make their way to the darker depths of adulthood. 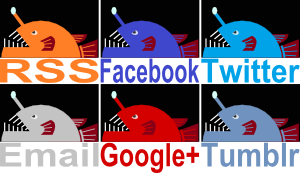 Blind Cusk Eels are different. They give birth to live young. It's likely they spend their entire lives from then on in deep water. After all, whoever heard of a ghost, even a baby one, walking around in broad daylight? Fascinating! Another good example of evolution marching on. With or without us. @elfinelvin: there's a lot of that sort of thing going on, it's what makes the deep sea so special!